A growing movement of governments, businesses, and civil society are calling for green growth – development that is compatible with environmental limits. The key to accelerating this type of growth and the transition to an inclusive green economy lies in collaborative partnerships. Such partnerships have huge potential, but often involve difficult processes: they require a significant investment in time and resources, and bring together individuals and organizations with different cultures, interests, incentives, value systems, and expectations. To inspire those who are forming collaborative partnerships for green growth, the 2030 Water Resources Group (2030 WRG) and the Global Green Growth Forum (3GF) have developed this case study. It provides insights on how collaborative partnerships can be a solution for green growth and what helps them succeed. 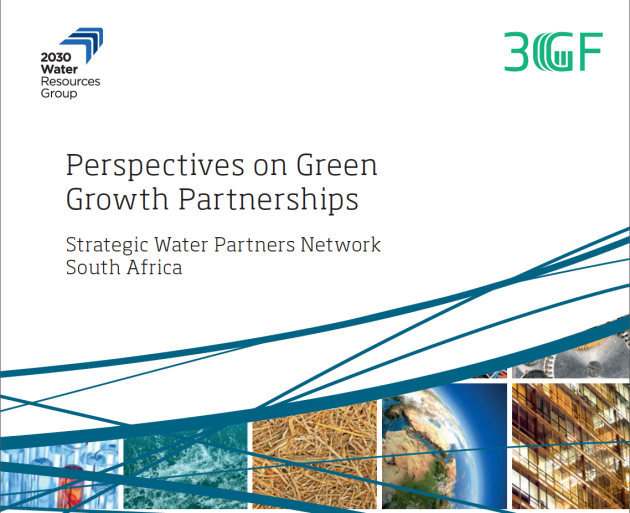 This document discusses the Strategic Water Partners Network (SWPN) for South Africa, which is part of the 2030 WRG network of country partnerships. The SWPN is a multi-stakeholder collaboration addressing South Africa’s most pressing water issues: improving water efficiency and reducing leakage, managing effluent and wastewater management, and managing agricultural and supply- chain water. Based on the perspective of the network partners, this case study demonstrates the benefits and challenges of companies working together with the government to overcome water challenges and identifies key success factors in establishing the partnership.